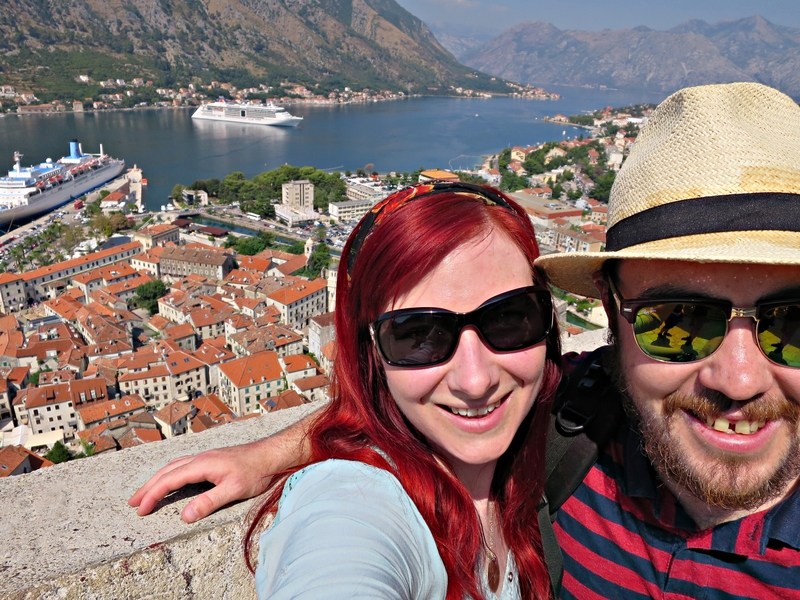 Kotor was our first stop in Montenegro, and was the highlight of our camping road trip in the Balkans. I first read about the must-see beauty of Montenegro in Lonely Planets’ Best in Travel 2013 Top Ten Countries list and it has been on my bucket list ever since. Prior to 2006, Montenegro had been one of six republics making up the country of Yugoslavia. But following a referendum that asked voters to decide whether or not to continue a state union with Serbia, Montenegro became an independent nation. Thankfully, the European Commission took interest in repairing the fortification for its cultural significance and also to maintain and develop it as a resource for tourism, a major part of the local economy. We approached Kotor in the dark, winding our way around the Bay of Kotor until we saw the pretty lights on the old fortress walls creeping up an enormous black mountain like a gold ribbon in the dark. We stayed right in the heart of Kotor’s unique old town and woke up in a fairy tale. Our hostel was in the very heart of the Old Town, and our room was in an authentic old town building, themed and incredibly comfortable. It was the best hostel accommodation I have ever stayed in, mainly for its perfect location, but also for its decor and authenticity. (Cue: Game of Thrones introduction music) Secluded on the picturesque Bay of Kotor (Boka Kotorska), the old Mediterranean port of Kotor is surrounded by fortifications built during the Venetian period and one of the most beautiful coastal towns in Montenegro. The city has a population of 13,510 and is part of the World Heritage Site dubbed the Natural and Culturo-Historical Region of Kotor. The Stari Grad (Old Town) features well preserved churches, charming squares, and informative museums inside the fortifications and will take about two hours to explore. The old town is so beautiful and surreal that you wouldn’t be the only one to think you had just stepped in to a fairy tale or on to the set of Game of Thrones. After strolling through Kotor’s Stari Grad, we walked halfway up to the Castle of San Giovanni (Fortress of St John), also known to the locals as Tvrđave Kotora, for a breathtaking panorama of the fjord and a fabulous birds-eye-view of the Old Town. The fortifications are situated on steep slopes and form a 4.5 km (3 mile) ribbon up the mountainside. Their crowning element is the fortress which sits around 280 meters above sea level. To get to the top, you must conquer about 1,350 “stairs” that can be slippery when wet and difficult to navigate if you are wearing inappropriate footwear. Though, we did see one beautiful women trekking delicately down the hill in painful-looking platform shoes. Most of the walls were built between the 9th and 19th centuries, with the continuous ring around Kotor’s Old Town completed during the 13th or 14th century. The architecture changed and new walls were constructed as military technology changed, to accommodate for firearms in front of the old ramparts. The Venetians, the Illyrians, Byzantines, and Austrians all had a hand to play in the building of the fortifications that feature ramparts, towers, citadels, gates, bastions, forts, cisterns, a castle, and ancillary buildings and structures. The 4.5km long walls are between two and 16 meters wide in different places, while the height can reach up to 20 metres. In the last 500 years, powerful earthquakes have rocked the area three times, damaging the Old Town and the fortifications. The most recent earthquake occurred in 1979. Of the two entrances, the best to take is the main entrance near the River Gate. Purchase your ticket (€3) to enter and you will also receive a handy descriptive brochure identifying the various gates, bastions, and other significant sites along the way. In front of the Church of Our Lady of Health, half way up the hill, you’ll find a semi-circular stone seat where you can rest and take in the spectacular vistas. If you are running short on time, this is where you can turn back and descend. But if you have the time, and a bottle of water, the views of the fjord with the church tower in the foreground can be seen just a little further up. These views are fantastic, and even more breathtaking from the very top. The walk to the top can take 45 minutes, so allow a few hours in the morning (before it gets too hot) for your walk up the mountain. At the top, there are several paths you can take. First, head left and climb through the hole in the wall to visit the pretty Chapel of St Ivan. Then climb back and head right to visit the fortress itself. Montenegro’s Kotor Fortress offers the most spectacular views of Kotor’s Stari Grad orange topped buildings and the electrifying blue bay below – certainly a must-do on any visit to Montenegro! Foodie tip: try calamari stuffed with ham and cheese, a local delicacy. We also found great pizza and some local beers for a relatively good price at Proto. And, they’re open until late. Read more about our awesome camping road trip in the Balkans.